Where’s the love for the defense? Sure, Edelman caught 10 passes for 141 yards, including two grabs on the drive that ended with rookie running back Sony Michel plowing into the end zone with the game’s lone touchdown. 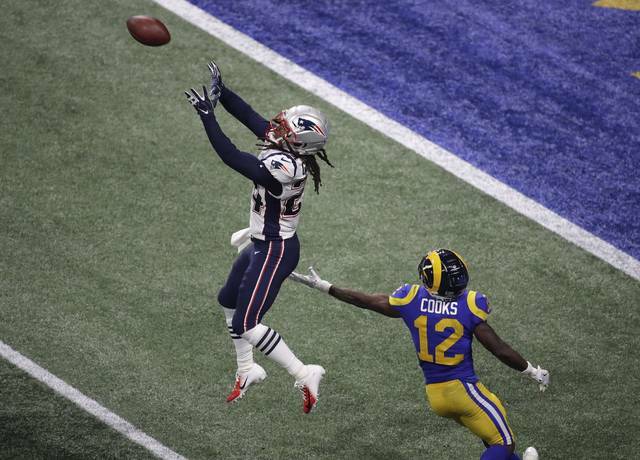 • Jason McCourty raced across the field to break up a would-be touchdown toss to Brandin Cooks, who was wide open — but … had … to … wait … forever … for Jared Goff’s rainbow pass that was knocked away just as it arrived. 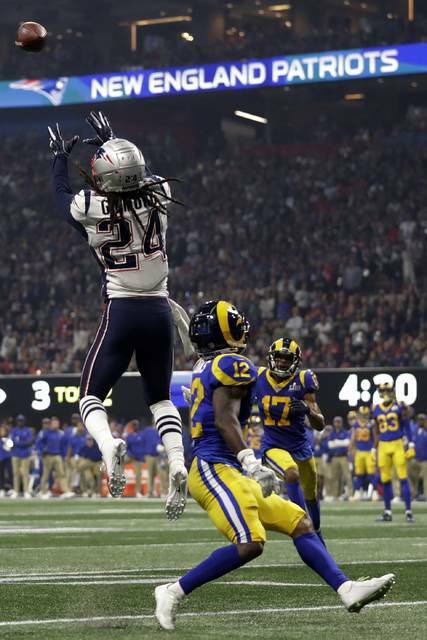 • Stephon Gilmore intercepted Goff’s pass in front of his end zone with 4:17 remaining on a pass intended for Cooks to seal the sixth title for Tom Brady, who outplayed Goff, and Bill Belichick, who outsmarted Sean McVay. Brady’s worst Super Bowl — three scores in 11 drives that didn’t end in kneel-downs — also was his easiest — a 10-point margin of victory was his highest ever. 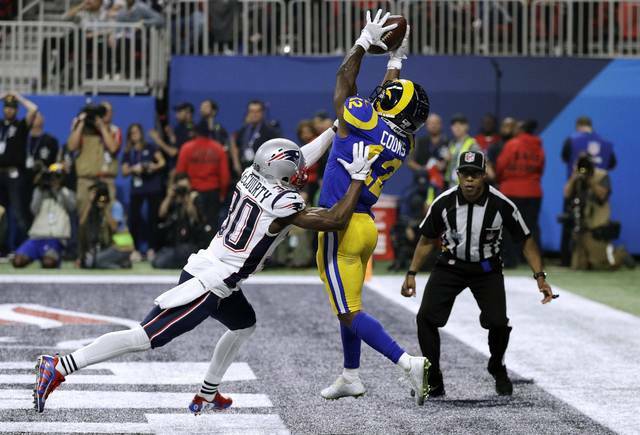 McVay and Goff both accepted the blame for a miserable showing in which Rams never adjusted to New England’s zone defense and aggressive D-line and managed to score just once in a dozen drives, the first eight of which ended in punts. After the red-white-and-blue confetti was cleaned up with leaf blowers at Mercedes-Benz Stadium in Atlanta, Rams quarterbacks coach Zac Taylor became the third assistant hired off McVay’s staff. He was hired as head coach the Cincinnati Bengals. At 35, Taylor becomes the second-youngest head coach in the NFL behind his former boss. The kind that didn’t show up in this Super Bowl. Vic Fangio, who spearheaded Chicago’s dominant defense, was the only other defensive assistant hired as a head coach this cycle, replacing Vance Joseph in Denver. The Packers hired Matt LeFleur, who was McVay’s offensive coordinator in 2017. The Cardinals dipped into the college ranks to hire Kliff Kingsbury, who tutored MVP Patrick Mahomes at Texas Tech. The Cleveland Browns promoted offensive coordinator Freddie Kitchens, who worked wonders with Baker Mayfield after his midseason promotion from running backs coach. The Jets hired Adam Gase, Peyton Manning’s former OC who wore out his welcome in Miami, and the Buccaneers brought Bruce Arians and his deep offensive roots out of retirement. Saints fans didn’t pay much mind to Super Bowl 53. A “Boycott Bowl” festival and a jazz funeral procession putting the football season to rest encapsulated how New Orleans residents felt about the Super Bowl, and even the city’s police department got in on the disenchantment. NOLA.com/The Times-Picayune reports the New Orleans Police Department made a spoof video showing their investigation into the infamous “no-call” in the NFC championship that the Saints lost to the Rams.